In this week’s post, I’ll discuss the importance of planning in a site redesign, as well as a few tips for beginners. First, let’s briefly talk about what a redesign is. I like to think of a redesign as a makeover for your site. It can be subtle or drastic, but it must take place when your old site’s design is no longer meeting your needs. Keep in mind that a redesign is not the same as a rebrand, which will undoubtedly require more resources and attention. Does my site need to be redesigned? As I’ve mentioned in the past, I can’t stand when people make design decisions without purpose. You can see this happening with companies that redesign a site every 6 months, to stay “current”. I’ve got news for you; this doesn’t make your company look current. It makes you look unprofessional and inconsistent. If you want to look current, it is often better to maintain a site design that is consistent with your branding but update your content on a regular basis. Once you’ve determined that a redesign would be in the best interest of your users, its time to get into the nitty-gritty of the design process. That’s right folks, the first step is to examine the problem, research and understand exactly what you need. For some, the website is all that will need a facelift. For others, the design will trickle down through their social media and corporate collateral. After you decide how this redesign will affect the rest of your branding, it is time to begin the planning process. Meet with members of each department – design, content, and marketing to determine the best strategy for the new site. By meeting early and keeping everyone “in the loop,” errors are less likely to happen in the future. Discuss what aspects of the site need to be changed, and who will be in charge of what. Next, work with everyone to create realistic, efficient schedules for all tasks. Give yourself plenty of time. It is far better to under promise and over deliver then visa versa. During this planning stage, it is imperative that you are brutally honest with yourself. What works on the site and what doesn’t? Don’t be offended if a solution that worked wonders three years ago doesn’t work today. Design and technology are ever-evolving industries, and it’s only natural that you’ll periodically need to do a little housekeeping. In “Responsive Design Won’t Fix Your Content Problem,” Karen McGrane discusses how responsive design is not always the solution. Often, clients need to put additional resources into their content strategy, or lack thereof. After all, the web is not necessarily about design. The web is about delivering information, or content, to users. We use design to make this information attractive and accessible. Consider how your site is currently handling content. Do you update your site regularly? Host a blog? Provide meaningful, useful content for your users? Well then your problem goes much deeper than a redesign. I’d recommend talking to content managers and strategists to get you on the right track before you can even consider a new layout. As I mentioned earlier, I can’t stand fickle companies who redesign just for the sake of redesigning. The most important group of people to design for are your users, specifically, your target audience. Don’t know who your target audience is? Look at your current client list. Which clients do you absolutely love working with? What do they have in common? Age? Gender? Socioeconomical background? You should begin to see patterns. This is likely your target audience. If you aren’t quite sure how to design for them, ask questions. Clients who value your product or service will be more than happy to give you their opinion of your site. Work from there. In addition to gathering information from clients, be sure to get feedback from members of the team. You may also find it helpful to establish weekly meetings with company executives, so they can be kept in the loop and understand your process. For more information on getting effective feedback check out this article. When the project is complete, set a reminder for 90 days in the future to begin usability testing. This will give you ample time to fix any unexpected bugs, and get a feel for what users may like or dislike about the new site. When the usability testing is complete, work to keep improving the site. A website redesign can be tough. The process will likely involve content strategists, designers, developers, marketers, social media specialists, and more. Determining if your site needs a redesign and what that redesign will entail may also take some tough love. However, by working together as a team, making a concrete plan, getting effective feedback, and keeping the user in mind, the process can actually go quite smoothly. 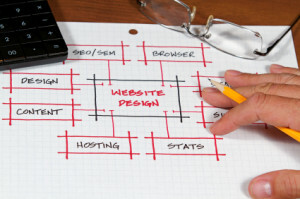 Does your website need a content strategy or a redesign? Contact Optimum7 today for a free consultation!